We celebrated big C birthday at PizItalia. C turned 5 on 12th March . PizItalia is located at East Coast Park Seafood Center. We chose the place as we heard that there was an indoor playground for kids in the premises. The place is easy to spot. 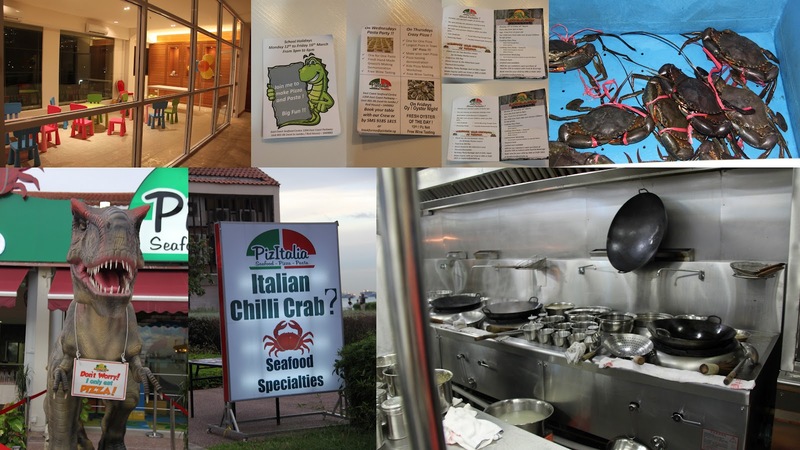 It is the only Italian joint nested at the corner amongst the 'well known' Seafood Eateries . It is located next to Little Red house. A little lost perhaps? We are supposed to look for a Dinosaur and we were greeted by a moving Tyrannosaurus! Mr T seems to have escaped from Hollywood film , 'The Lost World'. Actually we were not too far off. We had a pleasant chat with the owner Chris from France ( With Italian blood from Mom) . The dino was specially made in USA and imported to Singapore. Chris was a great host and a father of 5. He knows what it feels like bringing kids out for a meal and thus designs his restaurant to cater to family with kids . From my view, this is the single largest indoor playground in Singapore with a true blue restaurant at the helm (As opposed to indoor playground with 'mini' cafes) If the concept takes off, Chris may set by a chain in Singapore. Chris is not new to the restaurant business in Singapore , his first outlet is VivItalia at Courts Megstore Tampines. Smile before we are eaten alive! It's Dinner time. 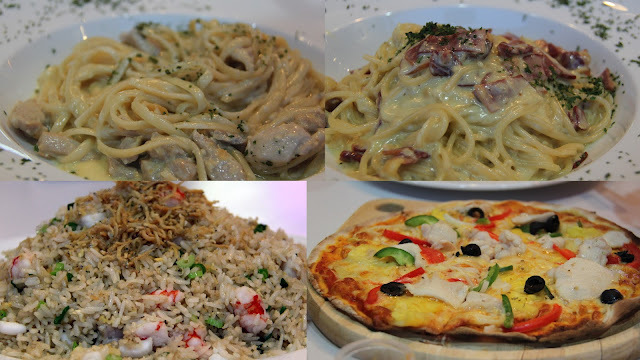 We had the classic Italian food like spaghetti, pasta and pizza. Pizitalian also serve some Asian food like Fried Rice (which we had) and a special dish called Italian Chilli Crab (We are not prepared for Crab that day). If you are interested in Crabs, they have a one for one from Monday to Thurs for a limited time only. Overall the quality of the food was good and not overwhelmingly Italian. We had a great time in PizItalia. Will revisit the place soon! We had the honour of Chris giving us an 'exclusive' tour of the kitchen. We must really try their Italian Chilli Crab cooked with Italian Herbs one day! Thanks Mom and Dad for the great day! Happy Birthday Big C. Hope you had enjoyed your special day! Thanks Chris! Gives us another reason to visit you again !